An Evanston police vehicle. The police department's pilot body camera program has been effective this summer, deputy chief Jay Parrott said. 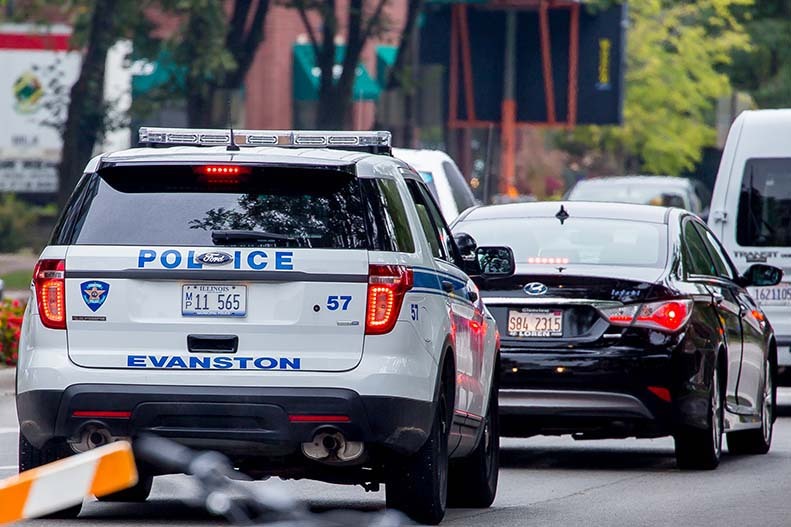 The Evanston Police Department presented early results of its body camera pilot program Monday, showcasing videos, testimonies and a sample camera. The program, which equipped 11 officers with body cameras beginning on June 3, has thus far collected 1,700 incident videos for the department, deputy police chief Jay Parrott said at a meeting at the Lorraine H. Morton Civic Center. If all officers were equipped with cameras, the department estimates they would have collected about 17,000 videos over the same time period, he said. Body camera videos collected from the program have been used as evidence in two specific cases — one a stabbing, the other an armed robbery — in which the Attorney General pressed charges after reviewing the video. Parrott said those charges may never have been brought without the video. Police Cmdr. Joseph Dugan said that the program has demonstrated broader benefits as well. The camera itself is an small, inconspicuous black square secured to officers’ chests which can record up to 12 hours of continuous footage, Parrott said. Officers are instructed to activate it during any incident, and upon activation, the previous 30 seconds of footage are also added automatically to the recording. Only the officers themselves can see the camera’s red recording light. Certain actions trigger camera activation automatically, such as taser use, turning on emergency lights or removing the rifle from the police vehicle. Dugan said the list of automatic triggers is expected to grow in coming years. After each incident, footage is uploaded to a cloud database, where videos of “flagged events” — including all situations in which an arrest was made — will remain for at least two years and will be accessible by public requests via the Freedom of Information Act. Parrott said one of the most important potential uses of the system is to check an officer’s actions if they are accused of acting inappropriately. In one recent instance, which officer Martin Neal recounted at the meeting, footage was used to clear him of wrongdoing in a traffic stop case. City manager Wally Bobkiewicz said that cost could be a “not insignificant downside” of full implementation of the program, which would require purchasing more cameras and hiring at least one employee to review and categorize footage. This summer’s pilot program was funded by a $140,000 grant. Nonetheless, Dugan said the department is largely pleased and encouraged by the results of the partial body camera implementation this summer.